A miniature model birds nest in dolls house scale made from reindeer moss and thread. Photo ©2008 Lesley Shepherd, Licensed to About.com Inc. These dolls house sized nests can be made in several scale sizes for miniature, railroad or dolls house scenes. They can also be made for spring or Easter displays to be attached to branches. The nests can be made to hold any type of scale egg. 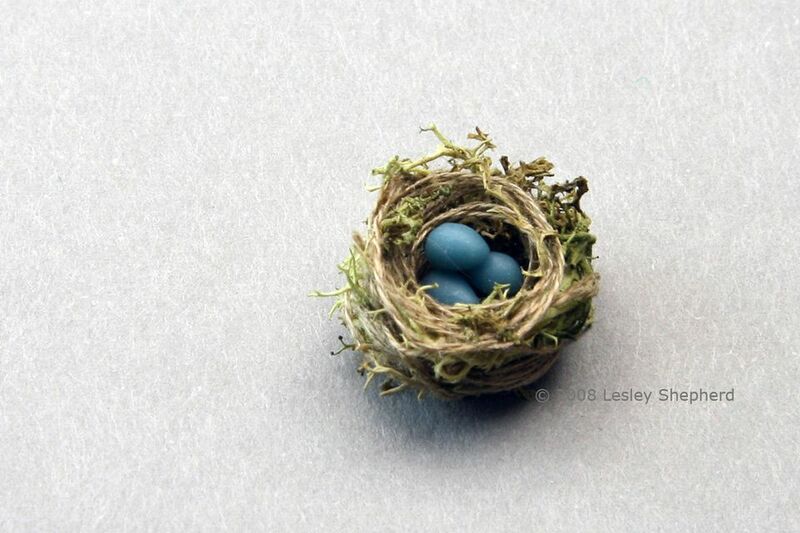 Here polymer clay has been used to make North American robin's eggs. The nests are simple to make. Reindeer moss has been used to simulate small branches often found in birds nests. If your bird species uses different building materials (clay on straw) you can still form the base of the nest using this method, then detail the nest for a particular species. If you are making these nests for 1:12 scale displays, remember that most birds have nests 6-8 inches (15-20cm) wide and scale your nest appropriately. There are also instructions on the miniatures site for making miniature birds. Reindeer moss, thread, glue, a round bead and plastic food wrap are the materials you need to make a dolls house scale birds nest. Photo ©2008 Lesley Shepherd, Licensed to About.com Inc.
Embroidery Thread in a dried straw or wood color. The one used here is a flax thread from DMC. Round Bead the diameter you want the interior of your nest to be. Cling Film food wrap or thin plastic to keep the nest from becoming glued to the bead. Tile or disposable aluminium dish to bake the clay on. Wrap thread back and forth around scraps of reindeer moss to make the basis for birds nest in dolls house scale. Photo ©2008 Lesley Shepherd, Licensed to About.com Inc.
To make a miniature birds nest which looks like it is woven from straw or grass and bits of branches or twigs, take some small scraps of reindeer moss and wrap them with straw colored thread. Go back and forth over the moss to make a two to three inch length of moss and thread which holds together loosely when you pick it up. Wrapping thread around reindeer moss to start making a scale miniature birds nest. Photo ©2008 Lesley Shepherd, Licensed to About.com Inc.
Take the twisted length of moss and thread to made in the previous step and wrap it around itself to form a nest roughly the size you want your final nest to be. Do not wrap it too tightly, you want the thread and moss to be fairly loose in this step. Gluing a dolls house scale miniature nest into shape using a wooden bead wrapped in plastic. Photo ©2008 Lesley Shepherd, Licensed to About.com Inc.
Wrap the piece of plastic around the round bead. Use a glue spreader to place a small amount of glue around the bottom half of the plastic covered bead and press your roughly shaped nest up against the plastic to glue it together. Set aside to dry. When the glue has dried, carefully remove the bead and the peel the plastic away from the glue on the interior of the nest. Don't worry if you can see the glue, you will cover it in the next steps. Trim the bottom and sides of the nest if necessary to make it the right thickness. Forming thread into a circular roll to make the lining for a miniature birds nest. Photo ©2008 Lesley Shepherd, Licensed to About.com Inc. Separate out two or three, six to 8 inch (15-20cm) strands of greyish, old straw colored, embroidery thread from the hank of thread. Pinch one end of the separated threads between your thumb and forefinger, and wrap the thread around this end while you continue to hold it between your fingers. This should create a flat circle of thread roughly the diameter of your nest. Set this aside carefully to keep it in a roll. The interior of a scale model birds nest lined with thread. Photo ©2008 Lesley Shepherd, Licensed to About.com Inc. Carefully spread a bit of glue around the inside of the miniature bird's nest on top of the glue from the step where you shaped the nest. If your nest is wobbly in any areas, secure it with a bit of glue on the inside. Holding your thread lining so it doesn't unravel, carefully place the lining over the top of the nest. Use the eraser covered end of a pencil or a similar object to push the circular lining gently down into the centre of the nest, allowing it to bend up the sides as well. Make sure the lining is pressed firmly into the glue. Trim off any noticeable thread ends. Set the nest aside to dry. Make miniature birds eggs from polymer clay for a model or dolls house scene. Photo ©2008 Lesley Shepherd, Licensed to About.com Inc. Follow the Instructions for Safe Handling of Polymer Clay. Combine Clay Colors to make the type of eggs you want to model. Here navy blue was combined with white to make a pale blue, then a tiny amount of yellow was added to get a deep robin's egg blue. If you want speckled eggs you can add a small amount of finely grated, baked polymer clay in the correct color. Roll out the polymer clay to the correct diameter for the thick end of the eggs. Cut sections of clay approximately one third shorter than you want the length of the egg. Here the eggs will be under two inches long, so the pieces were cut to 3/24 of an inch for 1:12 scale robin's eggs. Roll one side of the ball to make a narrower end for your eggs. Bake the eggs on a heat proof surface (a tile or disposable baking tin)according to the baking instructions for your brand of clay. Great Reference Photos for a wide variety of eggs and nests can be viewed in an online Birds Nest Gallery by the About birding guide. To finish your model bird's nest, check that the lining is securely glued in place. If the lining looks too regular, glue some tiny pieces of moss to thinner spots to hide any glue that shows through, or to make the lining look more realistic. Trim the nest to the correct thickness, covering any thin areas on the exterior with bits of thread and moss glued in place. Fill your nest with the correct number of eggs for a clutch of the eggs from your particular bird. North American Robins will usually lay three to five eggs in a clutch. Glue the eggs in place in the bottom of the nest. Your nest can be glued into a model tree at a fork in the branches, or glued into the support rafters of a small model building. You can also build these nests in your chosen scale, and use some of the same thread you used for the interior, to create a hanging loop to hang the nests in branches for a spring decoration, or fill them with colored easter eggs and hang them in the branches of an easter centerpiece display.